The Anthurium is some of the most widely grown indoor or houseplants in the world. They are easy to grow, have great foliage and wonderful colorful flowers. They can be grown outdoors in warmer climates, however it as indoor plants that they are most popular. The Anthurium Plants and species are most widely sold as indoor plants include A. andreanum or ‘Flamingo Flower’. This is one of the most popular indoor plants. 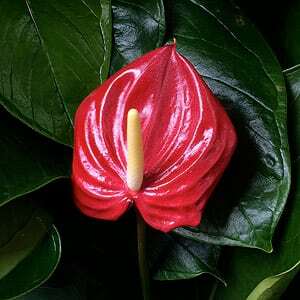 However a number of other species including Anthurium scherzerianum are also called the ‘Flamingo Flower’. They are an easy care plant and have very few problems. Large green leaves, and very colourful flower bracts in red or orange make these an attractive houseplant. They are also popular as cut flowers. Also look for the species grown as foliage plants, these include Anthurium plowmanii and Anthurium schlechtendalii. These are a naturally epiphytic plant, and while requiring moisture Anthurium also require a well drained growing medium. Seen as an indoor plant in all but tropical climates, Anthurium are fairly easy to grow and are valued for producing long lasting white, pink, red and mauve to lavender flowers. Flowers very are popular in the cut flower industry. Grow Anthurium in a well drained soil, a temperature of 25-32°C with a watering regime that lets the soil almost dry out and then give the plant a thorough watering. Lots of light bit not direct sunlight. After a few years Anthuriums will form aerial roots, generally time to repot and divide. These aerial roots can be planted below the surface.The best time to repot Anthuriums is in spring or autumn, when the weather is warm, but not hot. A good slow release fertilizer would be appropriate. In summary: So in cooler climates, indoors and warm, in warmer areas, outdoors in the tropical climates. Filtered light wherever you grow them and dryish winters. Excellent drainage – try a fine orchid potting mix. Filtered light – These are naturally an understory plant. Do not overpot, Anthiriums grow best with a restricted root run. Provide some extra humidity by sitting the pot an a saucer filled with pebbles and water. The pebbles should raise the pot above the level of the water. Fertilise with slow release type fertiliser. Use a liquid foliar spray once a month during active growth for improved results. These are a plant that grow from a rhizome, over time it will form a clump. The rhizomes can be divided into groups or two or three and replanted. It is also possible to propagate Anthuriums from seed. You will need fresh seed and they can be sown directly into pots. Seeds require warmth and humidity to germinate so use a cloche or top half of a plastic bottle to provide these conditions. Germination should occur within 4 weeks. Root systems will need to be reduced on division. If the plant has developed ariel roots, cuttings can be taken with roots attached and grown on. One of the most common problems with Anthuriums is the leaves turning brown is usually an indication of over watering. This need to be remedied quickly as it can end up creating a fungal problem and root rot. The solution is stop watering until the soil dries out, you may also wish to consider repotting in a free draining potting mix. This can be caused by over fertilising. The solution is to hold back on fertiliser, and to water the plant well until the water runs through the soil. Then stop watering to allow the soil to dry out. To much fertiliser causes a build up of salts, a deep watering can help flush these away. Anthurium Flowers are also known as the “Flamingo Flower”. Try Anthurium warocqueanum one of the best, or Anthurium dussi one of the largest. A number of varieties are mainly grown for their foliage unlike their relatives. A. crystallinum has large deep green rounded foliage contrasted with with heavy white veins, an excellent plant for foliage in tropical climates, or indoors. A. faustino-mirandae (fausto’s giant) has large glossy foliage. A. regale has velvety heavily veined foliage that can reach nearly 2m in length.